not without wheels from Colson Europe. Every day fresh flowers are available and on sale in shops worldwide. The journey these flowers have travelled through the supply chain might have been a long one. And in many cases it passed through the Dutch flower auction. Located in Aalsmeer, The Netherlands this auction is well known, not only for its scale, but also for its logistic solution. With optimized processes and systems enabling the delivery of fresh flowers globally within a fortnight. 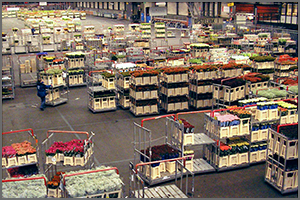 On a busy day at FloraHolland, worlds largest market place for flowers, 60 million flowers and 8 million plants are being processed on auctions both live on-site as well as on-line! Growers and traders from all over the world meet at Aalsmeer every working day to deliver, sell and buy flowers, plants and horticultural accessories. It is also referred to as the 'Wallstreet for flowers'. The flower cart, a vital element in the horti-supply chain! In the auction process, the uniform flower carts or 'stapelwagens' are equipped with quality wheels from Colson Europe BV. Every day thousands of such trolleys are being used in the trading process. Growers harvest roses for export e.g. to the United States by mid morning on any given day. By mid afternoon, machines will have sorted the roses by as many as 200 varieties, and by the length of the stems. These roses are gathered, labeled for quality, and packed in uniform plastic tubs for transport. By 10 p.m., the flowers arrive at the auction house where they are placed in cold storage overnight. The next morning at 4:30 a.m., they are transported to the collection hall, inspected, assigned lot numbers, and assembled onto "stapelwagens" or uniform carts for transport into the auction hall. The stapelwagens are then towed into the auction halls where their contents are auctioned, beginning at 6:30 in the morning in auction rooms with up to 500 buyers. 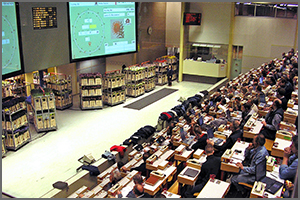 The computerized auction clocks in the room provide the buyers with information on the grower, product, unit of currency, quality, and minimum purchase necessary. Once the auction is completed, each lot of flowers is tagged with a computer print out of the sale and distributed to the buyer's area in the auction house where they are repackaged and boxed for air or land transport. Flowers exported to New York are transported on a special eight-hour flight, which departs Schiphol airport at 7:10 p.m. and arrives in New York at 8:10 p.m. local time. The cargo is then unloaded, inspected, cleared by customs and shipped to nearby warehouses or to other wholesalers for distribution the next day. Thus roses from an Aalsmeer greenhouse can be sold in New York within 48 hours after they are cut. Similarly, redistribution to other European countries by land occurs within 48 hours. Timing is crucial as the product declines in value towards zero within 10-12 days after the harvest. Other flowers, which are grown in e.g. Kenya Africa or Equador in Latin America, are loaded onto cargo planes and send to Aalsmeer. The auction, being only a few miles away from Schiphol Airport, has an optimum connection to the world. A challenging recent transport development in this respect is the special temperature conditioned transport by boat. The delivery of flowers towards the auction by boat is looked at carefully now. During the boat trip, the flowers are kept in a sleep-modus to guarantee the quality and life-time of the product. When flowers and plants arrive at the auction, they are moved into a cool storage. As soon as the products are sold they are transported to the distribution area. The carts are pulled in chains of up to twenty five carts by an electro-tractor. In the distribution area products are being made ready for shipment to countries all over the world. This transport is under continuous development to keep up with todays green standards. In this respect transportation by boat and or train is preferred over air- or truck because of a reduced carbon footprint. And so we from Colson Europe B.V. also enable your daily fresh flowers! 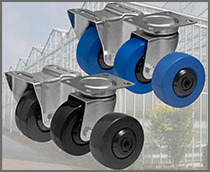 Choose Colson wheels and castors and opt for a green solution.